TO GET STARTED, please watch this video containing a detailed introduction to the Story-Type Method. It was recorded during a live presentation on writing thrillers, so that's an added bonus if you're interested in this specific genre. However, most of the content applies to any project, irrespective of its genre. You can also download a free 50-page PDF that provides a full introduction to the method. AFTER WATCHING THE VIDEO/READING THE PDF, have you identified the story-type of your project? If you have, you'll be given - after registering - direct access to tips, structural advice and examples of movies related to your project. If you haven't, The Structurator will ask you a series of questions to help you identify your story-type, so you can select the content relevant to you. IMPORTANT: if you're reading this, it means that The Structurator is still locked and you can only access the introduction video above. To unlock The Structurator and enable all the features listed below, you need to register (or to log in if you're already registered), then come back here. Best of all, The Structurator is entirely FREE! You just need to register to unlock it, or to log in if you're already registered. Did you find this introduction video useful? The Structurator contains a lot more information on story structure. It's not only a useful story tool, it's also a fun, interactive introduction to the Story-Type Method. And it's web-based, so there is nothing to download or install. Best of all, it's entirely free! "I have worked with Emmanuel on and off for two decades, so I thought I knew it all... but to see his theories mapped out in such detail here and to test my own story material against the brilliant Structurator was quite an eye-opener. As ever, with what seems like effortless common sense, he makes you drill down to the core story questions you thought you'd already answered... with some pretty 'dramatic' results! I am so pleased to see an alternative to the 'studio system' manuals we all know and slightly loathe - his approach is outside any 'formula' and is tremendous for those who need focus or, as I have felt so often, are feeling STUCK. In my experience, his Structurator could also be called The Re-Enthuser, (though it is not half as good a name)... I went back to work with renewed belief and better ideas." "I found the Structurator hugely helpful. I worked in script development for almost a decade, and nobody taught me more about the craft of screenwriting than Emmanuel. The Structurator is almost as useful as having him in the room, asking you questions which can frame your thinking about a project. Story problems that seem to be about the detail of particular scenes are often more about the big questions: who wants what, and what's getting in the way? Playing around with the Structurator breathed new life into an idea I've been toying with for years. Great!" "The Structurator is indeed useful. By defining your story-type, it makes you think about broader possibilities for your script. Something the experienced writer needs to examine as much as the starting writer does. Oberg knows his stuff and can present the art in a clear and different way. I’d recommend using The Structurator on all your scripts and seeing where its conclusions might take you." "I love the Gestalt of this idea/approach. What if there is an external problem (life and death) that can only be solved via the protag's ability to arc psychologically?" "Whenever I worked with Emmanuel, I was always blown away by his razorsharp insight on how to construct and structure screenplays. [...] The Story-Type Method cuts through to the essence and guides you when you are lost." "Eschewing a dogmatic approach to structure, Oberg allows for a methodology which embraces the diversity of stories that writers wish to tell and comes up with clear and practical approaches to developing narratives. This is a highly refreshing approach to the subject and one highly recommended to everyone from the aspiring screenwriter to the overburdened development exec." 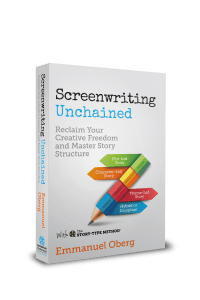 "Admirer of William Goldman, Emmanuel Oberg has a unique talent for revealing the dramatic structure of any movie. 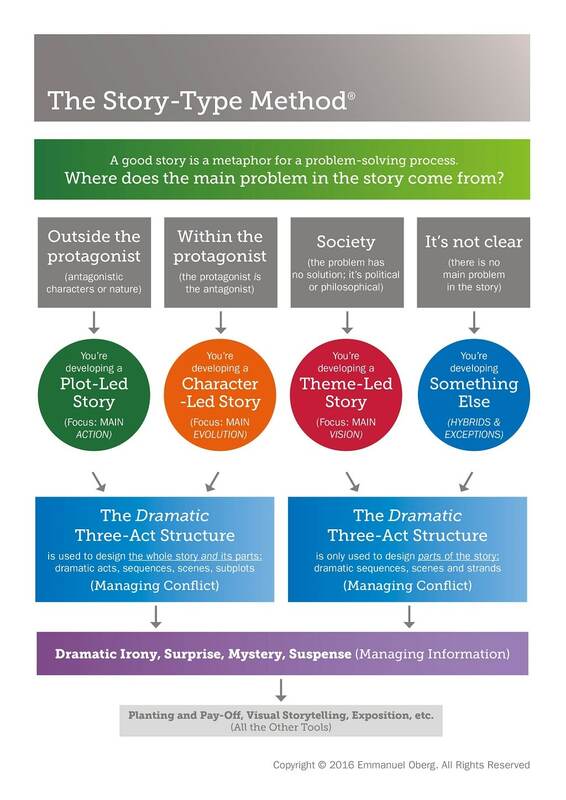 The Story-Type Method allows you to strengthen any story as you're designing it and Oberg's brilliant idea to apply Maslow's Theory of Human Needs to screenwriting will rescue many writers in danger of getting lost. "The way Oberg devises a properly 'unified theory' that is creatively rather than orthodoxy led makes it a fabulous one-stop, practical tool box for writers and developers"
"Not only is the Story Type Method enlightening, it's as creative and fluid as the writing process itself. And it puts the audience at the heart of the discussion. Not in a slavish way that suggests pandering to the market or duplicating previously successful formulas, but in showing the best way to make the story you want to tell enjoyable for the different audiences that are out there." 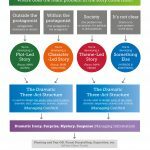 "The Story Type method as pioneered by Oberg is a particularly useful diagnostic tool and has helped me identify key structural flaws and weaknesses in my screenplays while equipping me with new tools and strategies to problem-solve."